We have won the battle again. Long live Devonport Hash. All the happy campers, including the little ones, were watered into submission. Dyke had to take special care of a little young girl that put up a particular brave fight with a bag of flour, and after an arduous fight he won that battle too, albeit with some drama and tears. The down downs at Crow's were plentiful, with Foghorn strategically placing himself in position to catch the inevitable spills. Special down downs for Bedpan and Koff who quietly turned fifty, for Maggie to show up after the battle was won, claiming a water allergy, for Foghorn just so he could dowse the audience with beer.... Anyways, you know the routine.Tucker was served after the circle and we all vowed to come back again next year. Next run (14 Jan) set by Guardsvan from the back of the Spreyton Primary School network near the Spreyton tip. 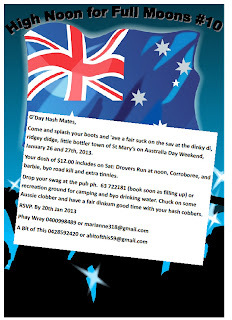 The weekend after that (21 Jan) is Knickers and Ratchet's Port Sorell Motorbike Hash from the Roundabout BBQ area. Motorbikes leave from Oz Rock in Ulverstone at 6pm sharp. And the weekend after that on the weekend of Jan 26-27 (Australia Day weekend) is the 10th consecutive High Noon for Full Loons at St Mary's. 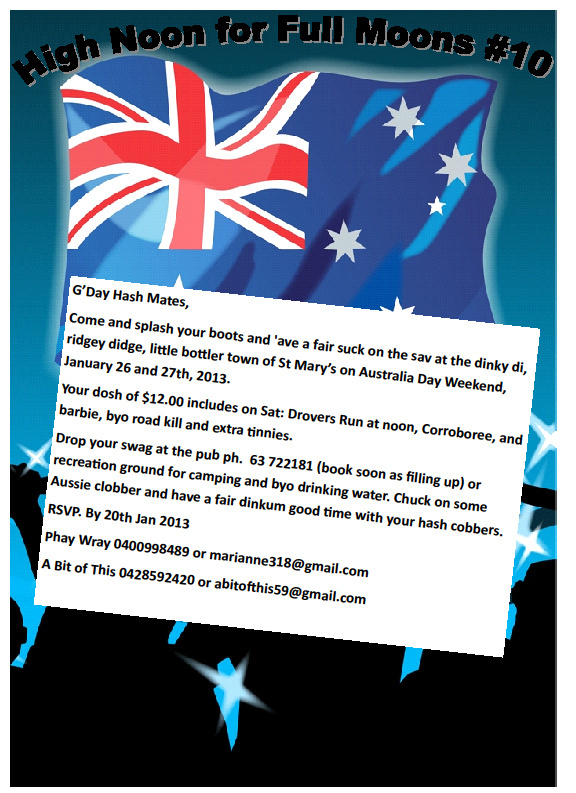 RSVP to bitathis@dhash.com or phaywray@dhash.com. Click on the flyer below for the readable image.